One of the things that I love about traditional Italian home cooking is how essential it is. There is a reason for everything, nothing is by accident. Food just makes sense here, and the more you see the changing landscapes and traditions of each individual region, the more you see why food and its traditions are so different from one part of the peninsula to the next. 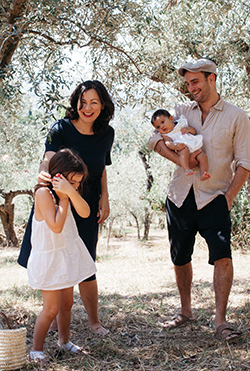 I recently travelled to Puglia, which is pure heaven for a food enthusiast. A beautiful region covering the Southern ‘heel’ of the Italian boot, it has a hot, dry climate that reminded me of Australia. The iron-red coloured soil is rich and fertile and produces some of the most amazing fruit and vegetables you can find in the Mediterrean, but the landscape of Salento, the southernmost part of Puglia, is dominated by countless olive trees, prickly pears, scraggly primitivo vines and figs, which seem to grow from nothing, sprouting out of abandoned farmhouses or cracks in church walls. One of the most memorable things that I ate in Salento was in the garden courtyard of A Casa Tu Martinu, a Slow Food restaurant “with rooms” (quite a handy thing if you’ve eaten and drunk a little too much; we actually stayed here for most of the week). As part of the antipasto, we were brought a bowl of vincotto and hot pittule, which are no more than simple, fluffy, deep fried balls of dough. Vincotto is a dark, sweet, almost balsamic-like syrup made from slow cooking grape must (the pressed, grapes one step before the fermentation of the wine making process), a condiment that dates back to the times of Ancient Rome. This delightful little dish seemed to me, like many of the dishes from Salento, so ancient and so earthy. Not only was it simple and traditional, but it was practical. The dish uses up the over ripened native grapes that don’t make it to the wine making process. 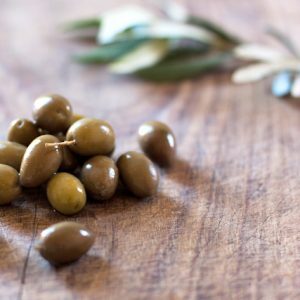 It’s also a condiment that keeps very well, which was handy for contadini pre-refrigerator and supermarket days. It replaced honey or sugar, which was not widely available and still is used as a sweetener for biscuits and pastries, but also is amazing with roasted meat, particularly game. While researching the recipe there in Salento, I came across another equally ancient and related recipe for miele di fichi, fig honey, which is also made in Calabria. Fig honey is not so much honey as it is a honey-like syrup made from sun drenched figs. Its caramel colour and deep flavour is incredible and it can be used perfectly in place of honey or sugar as a sweetener. Again, it’s just a natural way to use up the surplus of over-ripe summer figs. 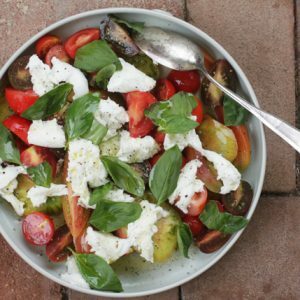 This can be made with very mature fresh figs or even dried figs. Fig honey keeps well in sealed jars for years so it’s worthwhile making yourself a big batch of these as you will soon realise how insanely addictive it is. Although no measurements are given, I remember reading somewhere that 20 kg of mature figs should yield 1 litre of fig honey. Although this recipe traditionally is made with mature fresh figs, I have done it with dried figs and the result is still wonderful. Using dried figs, you will obviously get a smaller amount of fig honey but a somewhat richer flavour. It also tends to keep better than ‘honey’ made from fresh figs once opened. Cut figs in half and place in a large pot with plenty of water to cover. Allow to simmer gently for a couple of hours or until the liquid is reduced by half. If you are using dried figs, you will need more water, so you may need to keep adding water until they are soft. Take out the figs and place them in a cheesecloth (or a pillow case or stocking!) and carefully – as they will be boiling hot – take the corners of the cloth and tie them. Not having a tree, I hang it on my sink’s tap and place a large bowl underneath in the sink for this part. You can also simply use a very fine strainer, or line a wider strainer with cheesecloth and sit that over a bowl. Let the liquid in the figs seep out and collect in the bowl. When the figs have cooled, you can also squeeze the cloth to help it along until absolutely nothing else can be squeezed out. Place this liquid back into the pot and bring to the boil. Allow to simmer again just until you have a dense, honey-like syrup and place this into clean, sterlised jars and seal them as you would a jam. 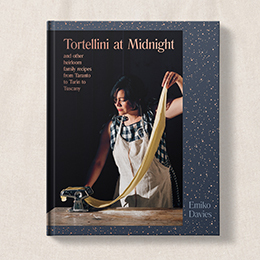 This is traditionally used in cookies such as cartellate, but think of all the wonderful uses for this. I imagine it could inspire and transform a beautiful, figgy semifreddo or tiramisu. I used it the other day to glaze roast pork. Possibly my favourite way to use fig honey, however is simply on plain yogurt, but sometimes I like to make a sort of indulgent breakfast crostone with this – fresh sheep’s milk ricotta on toasted bread, drizzled with fig honey. Heaven. I am not a big fan of honey but this sounds delicious…if only I had good and juicy Italian figs here! But will be in Italy in October…will they last? Luckily I think that this recipe is even better with dried figs, if you can get good quality dried figs where you are! Oh my this is beautiful. 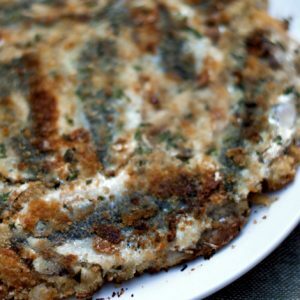 I absolutely love this recipe and dreaming about all of the different uses for it. Here in Iowa, I’ve only been able to find fresh figs at Trader Joes. I’m going to head out there today to see if they have any more specifically for this recipe. The figs I just purchased were literally devoured in a few days! Thanks Emiko! If you can find good dried figs, I really recommend them for this recipe (I find the flavour better and it keeps better too). Plus, you want to keep precious, fresh ones for devouring whole, as you say! This is a good recipe for when you have excess fresh figs (for those lucky enough to have a fig tree) or less than pretty figs, as an alternative to making jam. I hope you get to try it! I remember it!! soooo good! and I have tons of dried figs! 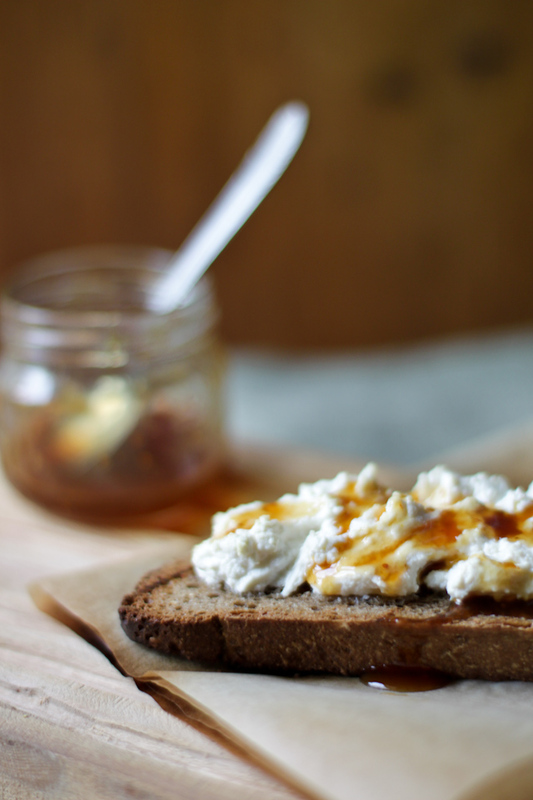 Thanks for this post and I absolutely love ricotta on toast bread with some drizzle of honey! It’s great to know that it can also be made with dried figs. 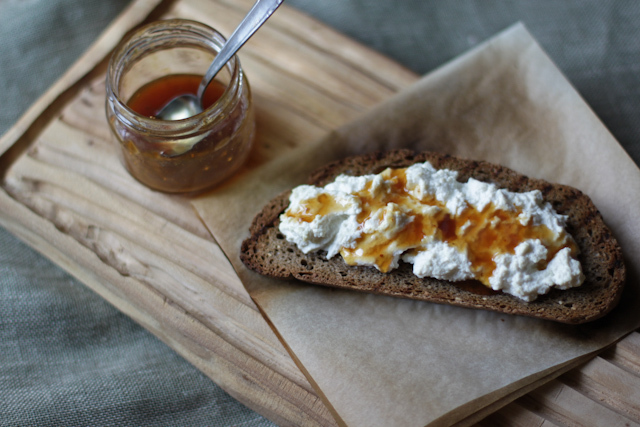 As I have just learned how to make ricotta at home, I am going to make this “honey” this weekend. Love your blog and pictures! I’ll have something on that very soon too…. Thanks Diana! Home made ricotta is wonderful, let me know how it goes with the fig honey! This sounds amazing – I’d never heard of it before. I’m going to have to try it soon! A question on the recipe–are you discarding the water that you boiled the figs in or do you use that later on? Thanks for your question Sarah! Perhaps I need to re-write it to be clearer but the water that you boiled your figs in is what becomes the honey. When you remove the figs and let them drip, collect the liquid that will come out of them further and add it to the rest of the liquid in a pot and reduce even further (until it becomes a dense syrup). Thank You for clarifying that, I was wondering too. I am going to make it tonight. Should have read this first before I asked my question. I tossed mine! Haha. So, draining the figs is simply not wasting the excess. Thanks for sharing this. I had fig honey for the first time at my family’s house in Calabria this summer and was excited to make some, which I just did and am happy with the outcome. My question is, should I can it? Whats the best way to make sure it doesn’t go bad on me? 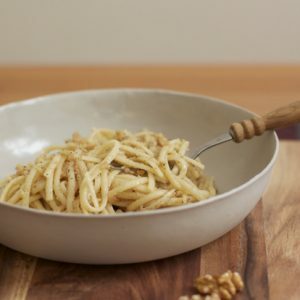 Thanks for your comment Kenny – this recipe should keep for a very long time; according to the old Pugliese recipes, fig honey will keep very well, lasting you a year. It doesn’t last that long in my house ever of course, but if you are planning on keeping it, make sure you seal it properly in sterilised jars and keep it somewhere cool. Good luck! Is there a place to buy Fig Honey already made? I don’t know of a ready made one, it’s a very traditional recipe and was usually made at home – as you can see, the recipe is simple enough and works very well with dried figs when fresh are not available! I just came upon your recipe the other day, and made a big batch yesterday. However, I simmered it for 7 hours to reduce by 1/2. At midnight I pulled the figs & put in cheesecloth over night. I am hoping that leaving everything over night was okay. I am going to continue cooking it all again today to reduce it to a syrup. Also, there is alot fig remnants in the “simmering liquid”, do you strain that, or is that simply the rustic home made part of it? Thank You for this recipe, everyone will be so happy come the Holidays. Strain the remnant fig and that can be used for something else — I’m thinking it’d be good in a banana bread for example or added to a jam!– but is not needed for the fig honey. Good luck, sounds like you’re nearly there! Hi, I have a 30+ year old fig tree that produces wonderful figs. This year so far I think we’re at about 40kg of figs. Your recipie came just at the point where I had run out of ideas (I have already made fig and cinnamon jam, dried figs, fig paste and figs in Brandy). Following your recipie was easy and I now have two bottles of wonderful, deep, rich fig honey. I’ve even found a use for the fruit pulp (in the bottom of a pie pan with butter and brown sugar topped with a cake batter). Thank you so much for my new favourite thing to do with figs. You’re very welcome! This is exactly what this recipe was used for — an excess of ripe figs! So glad you enjoyed it. I have a question, the photo in the third row with the yellow fig-looking-things on a plate, what exactly is that? Looks like figs prepared in a certain way that I have never seen before! Looks very delicious too. They are the pittule that I mention in the post, delicious balls of deep fried dough, which come served with sweet, syrupy vin cotto. Absolutely divine! I am making the fig honey. I had a pack of dried figs with me for a while. Not knowing what to do, I was about to chuck it away, luckily I saw your post. I have a question, is there anyway we can use the leftover figs ? Thanks for your comment! Personally I would use the leftover figs to make a paste for eating with cheese! Or add it to cake or muffin batter. I’m so glad I found this! I make silan (date honey) but I’ve never tried making miele di fichi. It’s a bit embarrassing since I’m Italian and we had fresh figs coming out of ears while I was growing up. Does it matter which type/cultivar of fig is used? I have a ton of dried organic Calimyrna figs at the moment (thanks, Costco!) and am considering making this recipe but won’t if I have the wrong type. Have you ever tried soaking the dried figs in filtered water overnight first? Maybe this would plump them up and help them become soft enough that it wouldn’t be necessary to add so much extra water when you start to simmer them? What do you think? PS) In case you’re interested, this is my favorite silan recipe: http://toriavey.com/toris-kitchen/2014/08/date-honey-syrup-silan/. Silan recipes are all basically the same but I think Tori does a nice job of laying out the steps. And yes, it basically the same as yours. I don’t think the type of fig matters so much, this is a preparation you could do with any. And yes, you could soak them the night before too, great idea! Hi. What do you do with the excess water? Is it reusable? I tried this with Celeste figs and got very little syrup, it was great though. But so little of it, wondering if I did something wrong? Should I have also used the excess simmering water as well or thrown it out? Pardon my ignorance. Thanks. compromise a supporting hacking tool in useful. Hola thanks for the recipe, here in Spain the fig trees in the countryside are laden with fruit and you can go and pick them until your fed up with them. Although it takes a bit of time to make it will make lovely gifts for people. Thanks for your message! It is worth it, isn’t it?! Is there a use for these besides compost? As long as the bugs and other things haven’t gotten to them, I think this fig honey would be an excellent use for very ripe figs! Back from vacation. Made fig honey from fresh picked as the ones on ground were bug and bird eaten or fermenting. The syrup was very dark and i wondered if i cooked it too long and burned the bottom, but it was the dark skin that added color. This 40 plus year old Black kadota tree loved our wet spring and has continued its second harvest so once again i am sorting figs! God fed the birds, and now it is my turn to enjoy the abundant gift He has bestowed. Hopefully i will beat the bugs and the 100 degree weather dried the figs before fermentation started. Oh yes, dark skinned figs will contribute to that beautiful colour! Hope you enjoy it! protect against content from being stolen? I’d truly appreciate it. made me in my opinion consider it from a lot of various angles. accomplish with Woman gaga! Your personal stuffs outstanding.